Get ready for the show of a lifetime! 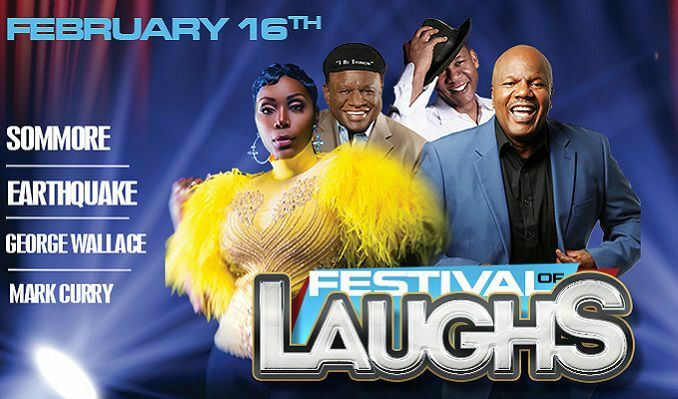 On Saturday 16th February 2019, the incredible Festival of Laughs: Sommore, George Wallace, Earthquake & Mark Curry will arrive at the Verizon Theatre at Grand Prairie!! Get ready for a night of the very best entertainment that money can buy! This is the show we've all been waiting for… Don't miss your chance to be a part of an event that you will never forget! Grab your tickets NOW! At the Verizon Theatre at Grand Prairie, you’re guaranteed a show like nothing you’ve ever seen before. Known across Texas as the number one destination for the biggest names in music, the top award-winning performers from around the world bring their phenomenal stage shows to Grand Prairie. This one is no different – fans are very excited! Now’s your chance to be in that crowd at the concert of your dreams! Make it a truly exceptional Saturday with a one-of-a-kind-concert that only Festival of Laughs: Sommore, George Wallace, Earthquake & Mark Curry can bring. Catch them LIVE on Saturday 16th February 2019 by booking your tickets in advance now!